The use of bathroom household chemicals and the high potential for mold growth from excessive moisture are the two main sources of potential indoor air hazards typical to most bathrooms. This guide will help you determine if your bathrooms are contributing to poor indoor air quality throughout your home. Most bathrooms are filled with toxic chemical products such as room deodorizers, toilet bowl cleaners, drain cleaner, mildew remover, glass cleaners, bleach, and floor cleaner. There are also many potentially toxic health and beauty related products such as hair coloring, perfume, deodorant, hair spray, and pharmaceuticals. Summary health and safety information for the most common culprits is lower down this page in the Bathroom Chemical Products List. There is also a site search box below to help you find many other healthy home tips found throughout this entire website. Is Your Bathroom Contributing to the Death of Our Oceans? How many pounds of the below poisons do you buy and use every year? How many of their chemical compounds end up in your lungs, blood, and septic system (and ultimately the oceans)? Are you keeping these potentially poisonous products out of the reach of children? Even our crammed medicine cabinets contain potential poisons to not only us, but also the environment. A growing number of studies prove that the all too numerous pills many of us pop daily (and ultimately poop) - such as anti-depressants, antibiotics, and many other over-diagnosed / over-used drugs, are resulting in these pharmaceutical molecules passing right through sewage treatment facilities and into aquatic species. This dangerous pharma soup of exotic organic compounds is bioaccumulating and causing harm to freshwater fish and ocean derived seafood populations. Talk about depressing. What comes around goes around when we pollute the water, whether by our toilets or our drains. It never ceases to amaze me how common it is for people to think it is ok to pour a wide variety of household chemicals down their drains and toilets where they then seem to magically become out of sight, and thus out of mind. But these chemicals are still being flushed into the environment one way or another, and they may end up doing more than just kill the beneficial bacterial colonies in our septic tanks and sewage systems - causing sewage backups. Dumped chemicals often persist and end up eventually accumulating into our food web. It is like an urban myth that it is ok to dump these chemicals down toilets and drains with no consequences. If you think this way or if you know of someone who does, please try to affect change in your or their thinking about the harm it causes even though it may not be obvious to you. Toxic Sewer Gas from Septic Tank Chemical Reactors? Sewer gases can be flammable due to combustible components like Methane Gas created by microbial activity. Sewage gases can also displace air and cause death by asphyxiation due to the resulting low oxygen environments created in confined spaces. Sewage gases may also be toxic from common components like Hydrogen Sulfide gas, or other less common components resulting from disposal of chemicals in drains or toilets. In some rare extreme scenarios some homeowners have found out the hard way that pouring household chemicals down the drain may even result in poisonous sewage gases resulting from a chemical reaction that occurs when chemicals mix in the septic system. Potentially deadly Chloramine gas is but one such possible toxic sewage gas that could result from dumping various chemicals down drains or toilets. Chloramine gas (NH2Cl) or Chlorine Gas (Cl2) may become airborne when household bleach mixes with products that contain acids, such as vinegar, ammonia, drain cleaners, or toilet bowl cleaners. Depending on conditions such as temperature, mixing conditions, and concentrations of reactants, other irritant gases such as Nitrogen Trichloride (NCl3) and Dichloramine (NHCl2), may also results from the above reactants and products. Besides being potentially deadly, inhalation of poisonous Chlorine or Chloramine gas is known to cause loss of voice, coughing, feeling of burning and suffocation, damage to mucous membranes, and even chemical pneumonia. Chlorine and Chloramine is an obvious example of why NOT to dispose of household chemicals down drains and toilets. Hopefully your home is properly constructed to vent potentially flammable and hazardous sewage gases through plumbing vent pipes that usually extend up through your roof and vent to the outside, rather than into basements or interior rooms. Proper sewer gas ventilation can be a problem in older homes where piping is outdated or damaged, or in cases where plumbing is poorly designed. 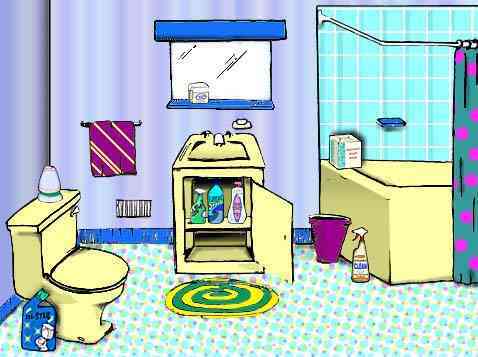 Below is summary information for the most commonly used bathroom products - including ingredients information and tips for how to safely use, store, dispose of, and eliminate their over-use. All of the below household products found in bathrooms contain one or several hazardous substances which can contribute to poor indoor air quality and environmental damage. The main reason these household chemicals (for example hair spray and nail polish) can be sources of indoor air pollution is because they often give off volatile chemical toxins that enter the air while being used or stored, and even well after being used in or around the home. The best way to measure chemical hazards in your home is to have your air tested (see link to my bargain chemical/mold test kit below). These tiny toxic gas molecules and particles can become airborne and accumulate inside your air-tight home, where the HVAC system may distribute them to other rooms where they can then be inhaled over long-term periods by anyone or any pet inside the home. Occupants who are very young, very old, or who may have a pre-existing condition are more at risk from exposure to these toxins. And most home air purifiers can't even filter these Volatile Organic Compounds (VOCs) out of your air because specialized expensive chemical filters are required, and so are usually only found in only the best home air purifier having gas-phase filtration. VOCs are likely responsible for most indoor air quality complaints and are a major cause of Sick Building Syndrome. With long-term exposure, VOCs can result in chronic diseases such as cancer, kidney damage, liver disease, and neurological disorders. If you suspect your home is making you sick, or if you frequently have burning eyes, headaches, respiratory difficulty, soar throat, or fatigue - it is possible you are breathing elevated levels of VOCs from such products as those used and stored in your bathroom and other rooms. The truth is, it is hard to avoid breathing some level of these toxic gases while indoors. This is because VOCs are often perpetually given off by various in-home sources, such as carpeting, furniture, particle board, OSB board, adhesives, paints, varnishes, and many other structural components or contents of homes. You just can't escape them in most cases. So with VOC toxins so common, it is a particularly bad idea to use and store additional chemicals inside. If you use several of the below bathroom household chemicals, chances are you are making the levels of inhalation hazards that much worse. You should at least remove from your home the low-hanging fruit of toxins. That often means reducing your purchase and use of household chemical products where feasible. Another common bathroom indoor air hazard involves the growth of Toxic Black Mold and the spores and other air contaminants the colonies can release. Mold and Mildew colonies often get a stubborn foothold in, around, or under bathroom areas because of the potential for water leaks, condensation, and high humidity. Mold and mildew thrives in moist conditions, so they love bathrooms. Often water leaks and condensation problems cause hidden mold colonies to begin between walls where water pipes run, or under shower drains in sub-flooring. It can be hard to detect a problem unless the mold is already widespread and the damage visible on floors, ceilings, or walls. To see if you may have an indoor air quality problem and identify the possible sources, I highly recommend testing your home air for a wide variety of Volatile Organic Compounds as well as for hidden mold colonies that you may not even know about. This easy and accurate diy home air test kit is the only one I know of that will test for over 400 chemicals + Hidden Mold colonies. No other test kit can detect hidden mold and VOCs to that extent and at that very low price. There are many over-priced mold test kits that focus on detecting airborne mold spores, but the problem is mold spores are often hindered by walls and flooring, thus making hidden mold hard to detect by conventional method involing mold spore count. If you want to detect hidden mold colonies such as those growing around a leaky water pipe behind your shower wall, my test kit is the only one on the market today that actually is sensitive enough to measure MVOCs (Mold Volatile Organic Compounds) which are gases expelled by actively growing mold. Measuring MVOCs is a very advanced way to detect mold while it is still hidden in the structure of homes. Unlike mold spores, MVOCs can easily pass through structural obstacles like walls and flooring and they are constantly being released by living mold colonies, unlike spores. This is the best way to find mold and chemical problems before they cause serious allergy symptoms or Sick Building Syndrome. Many home inspectors, home buyers, and tenants are using the above test kit to assure healthy indoor air before contracts are signed. How Many of These Common Bathroom Household Chemical and Hazardous Waste Sources Are You Stockpiling? Aerosol sprays (e.g., furniture polish, deodorant, and air freshener) contain an active ingredient and a liquid or gaseous propellant that is packed under at least 40 pounds of pressure per square inch. These pressurized aerosol containers are explosive and may be flammable. The actual product propelled by the aerosol, such as some oven cleaners, can be corrosive or poisonous, therefore requiring great care. Aerosol sprays should be used with care. The fine particles emitted from aerosol sprays are easily breathed deeply into the lungs and quickly absorbed into the bloodstream. Thus, a chemical that is harmless to your skin may become extremely dangerous if inhaled as a mist. Acute symptoms include headache, nausea, dizziness, shortness of breath, eye and throat irritation, skin rash, burns, lung inflammation, and liver damage. If spray is misdirected, chemical burns and eye injury can also occur. Intentionally inhaling aerosol gases for kicks, sometimes called "sniffing" or "huffing," has resulted in the death of several young Americans. An aerosol container should never be heated significantly above room temperature because it can explode. Storage of cans in direct sunlight, car trunks, and near furnaces, stoves, and ovens can result in explosion. When heated, aerosol gases can turn into toxic gases including fluorine, chlorine, chloride or hydrogen fluoride, or phosgene (military nerve gas). Breathing these vapors can be very harmful to you. Go to our Complete Guide to Asbestos for complete information about Asbestos including extensive MSDS information, list of specific product brands with Asbestos, jobs, symptoms, and case studies of asbestos exposure. If you encounter asbestos or suspect asbestos hazards these asbestos tips may also help. Asbestos is a naturally occurring group of minerals that are flexible, fire resistant, and virtually indestructible. Many hundreds of products contain asbestos fibers. Some general categories are insulation, asbestos cements, fire-proofing, fireproof clothing, floor tiles, pipes, brake and clutch linings, pot holders, ironing board pads, hair dryers, and textured paint. In the recent past, some uses have been banned: spraying asbestos-containing materials (1973); certain pipe coverings (1975); some patching compounds and artificial fireplace logs (1977); spray-on asbestos decorations (1978); and hair dryers containing asbestos (1979). In most products, asbestos is combined with a binding material. However, if the tiny asbestos fibers do become airborne and inhaled, they can remain in the lungs and may cause severe health problems that do not appear until many years later. There is no known safe exposure level to asbestos. Asbestos toxicity surfaces only after a long latent period. The respiratory tract is the usual target organ. Asbestosis and asbestos-related cancers such as Mesothelioma are the two main categories of asbestos disease. Disinfectants are considered pesticides. They reduce some germs and are a temporary measure at best for making your home "germ free." Skin contact and vapors can be irritating and corrosive to the respiratory system and skin. Disinfectants are especially hazardous when dispersed from aerosol cans because the disinfectant can be easily ingested through the nose and mouth. Disinfectants may contain one or more of the following hazardous substances: Ammonia, cationic detergents, cresol, lye, phenol, pine oil. Please refer to these compounds for specific health hazards associated with these ingredients. Chemical drain cleaners (also called drain openers) are extremely corrosive and dangerous to use. Common ingredients in drain cleaners include lye or sulfuric acid. These chemicals work by eating away materials, including your skin if it should come in contact. Likewise, vapors are harmful. If you are on a septic system, you should know that drain cleaners are hard on your system as they kill the microbial bacteria which are necessary to the workings of your septic tank. The use of chemical drain cleaners as a "preventative" measure is not a good idea. Boiling water or a handful of baking soda and half cup of vinegar poured down the drain weekly is at least as effective as a chemical drain cleaner and much, much safer for you and the environment. Also effective,particularly in preventing clogs, are many brands of enzymatic cleaners. If you have used a chemical drain cleaner and the clog still exists, Do not try to clear the drain with a plunger or pressurized drain opener. This would only invite splashback. Also, do not add other cleaners to the drain following the use of a commercial drain cleaner. The combination of chemicals can produce toxic gas or become reactive and blow out of the sink and on to you. If a chemical drain cleaner has done nothing to help your clog and you still have standing water, then there is no reasonable choice except to call a professional to fix the clogged and now contaminated drain. Be sure to tell them what product was used in the drain so that they may adequately protect themselves. If a drain cleaner claims to be "non-caustic" or "noncorrosive," it should state its ingredients. The product may still be poisonous if inhaled in heavy concentrations or swallowed. Window and glass cleaner commonly contains isopropyl alcohol or Ammonia, water, and coloring. It may be mildly irritating to the eyes, skin, nose, and throat. Use: Always use window and glass cleaners in a well-ventilated area. Disposal: Unused or unwanted portions of window or glass cleaner should be flushed down the drain with plenty of water. Hydrogen peroxide is a clear, colorless liquid. Common household hydrogen peroxide contains a 3-5% concentration. It is used as a disinfectant and deodorizer. However, the benefit is of short duration. In general, ingestion or skin exposure of small amounts of household hydrogen peroxide will cause no serious problems. It is mildly irritating to the skin and mucous membranes and causes a whitish discoloration. Industrial strength hydrogen peroxide used as a wood or hair bleaching agents (10% concentration H2O2) may result in severe burns to the skin, throat, and gastrointestinal tract. Disposal: Unused or unwanted portions of household hydrogen peroxide should taken to a hazardous household waste collection center. If a collection center is not available, 3-5 % peroxide solutions can be flushed down the drain. If you use a septic tank or lagoon, dispose of small quantities over several days. For information about disposing of 10% peroxide solutions, contact your local fire department or wastewater treatment plant. Isopropyl alcohol, also known as isopropanol, is a colorless liquid with a pleasant odor. It is highly flammable. Isopropyl alcohol is found in alcohol sponges, cleaning agents, and rubbing alcohol (though some rubbing alcohols contain ethanol), and is a good disinfectant. Most rubbing alcohol contains 70% isopropyl alcohol. Poisoning can occur through skin absorption, oral ingestion, or inhalation. Symptoms from ingestion, inhalation or absorption of large quantities include flushing, headache, dizziness, mental depression, nausea, vomiting, anesthesia, and coma. Alcohol baths or sponges to soothe a fever can lead to acute poisoning through skin absorption or inhalation. Instead, the Regional Poison Center suggests using tepid water as a sponge bath to fight fever. Use: Wear protective gloves when using (see "Household Safety Equipment"). Use in well-ventilated areas. Storage: Keep out of the reach of children and pets. Make sure lid is tightly capped. Store away from sources of flame or ignition. Disposal: Flush down drain with plenty of water. If you have a sewage tank or lagoon, dispose of small quantities over a number of days. Borax is an effective mildew remover and short-term preventive. Pharmaceuticals, which include both prescription medicines and over-the-counter drugs, can be disposed of easily and safely. The best way to dispose of pharmaceuticals is to return the unwanted portion to your pharmacist. Many pharmacists are willing to accept and properly dispose of unwanted pharmaceuticals. The second best alternative is take the drugs to a hazardous household collection center. If a collection center is unavailable, many medicines can be flushed down a toilet connected to a sanitary sewer. NOTE: this excludes chemotherapy drugs, antineoplastic medicines, and shampoos for head lice, which should never be disposed of down a toilet. If you have a septic tank or lagoon, return your unwanted prescriptions to the pharmacist or take to a household connected to the sanitary sewer. Do not place pills in the trash where children could possibly try them with dire consequences. Most scouring powders use calcium carbonate as the abrasive, and may contain chlorine bleach. To prevent the formation of toxic gas, do not use cleansers containing bleach with other cleaning products such as toilet bowl cleaner, oven cleaner, or all-purpose cleaners which may contain Ammonia. The combination of bleach and ammonia produces toxic chloramine gas. In sensitive individuals, scouring powder that contains chlorine may irritate and redden the skin. Disposal: Use up as intended or give it to someone who can. If unwanted portions must be disposed of, flush down the drain with plenty of water. However, if on a septic tank or lagoon, dispose of small quantities over a number of days. Alternatives: Baking soda or salt can be easily substituted for scouring powder. Alternative commercial products based upon diatomaceous earth are relatively safe, effective and non-abrasive. Nylon and other non-metallic scrubbing pads may also be effective. If you have any of the above bathroom products inside your house I strongly recommend you read the label closely for storage, disposal, and usage instructions. Additionally, ventilation and air purification using Activated Carbon or other chemical fume filtering media can help to reduce Volatile Organic Compounds and dangerous chemical particles which results from areas in the home where many of these household chemicals are ultimately used or stored. However, source reduction should be the first line of defense. Ideally you should try to find safer, non-toxic green products to replace the more toxic and environmentally damaging ones. Consumers are driving growing demand for a wide and growing variety of effective green cleaners and other eco-friendly alternatives that go a long way toward creating healthier homes and less damage to our oceans. So get started today and see what hazardous products you can eliminate forever from your medicine cabinets and bathroom vanities. Then move on to the other rooms of the house linked to below. Make your home a chemical-free home and it will pay off in many different ways - healthwise, environmentally, and fiscally.